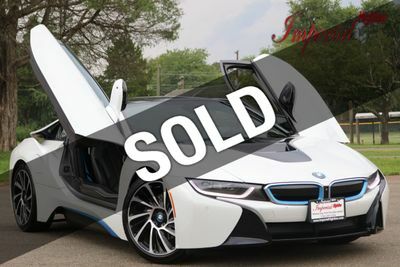 All Wheel Drive And Powered By A 1.5L Turbo 3-Cylinder Hybrid Engine Producing An Impressive 357 Horsepower, This 2014 BMW i8 Is One Incredible Machine! 100% Backed By A Clean And Clear CARFAX History Report Showing No Accidents Or Odometer Issues Of Any Kind, This 1-Owner BMW Comes Loaded Up With Black Leather Interior, Keyless Go With Push Button Start, Heads Up Display, Factory Voice Guided Navigation System, Front Collision Warning System, Power Heated Front Seats, Tilt And Telescopic Steering Wheel With Multifunction Controls And Paddle Shift, Dual Zone Climate Control, Music Collection Internal Hard Drive, USB/AUX Audio Inputs, SIRIUS Satellite Radio, Bluetooth Technology With Live Streaming Media Via Bluetooth Audio, Factory Homelink System, Electronic Park Brake, Front And Rear Parking Sensors, Reverse Camera System, 20" Premium BMW Wheels And So Much More! Don't Let This Amazing Ride Pass You By! Act Now By Calling Us At 703-257-1234 To Set Up A Test Drive! Superior Financing Options Available! We Look Forward To Earning Your Business!